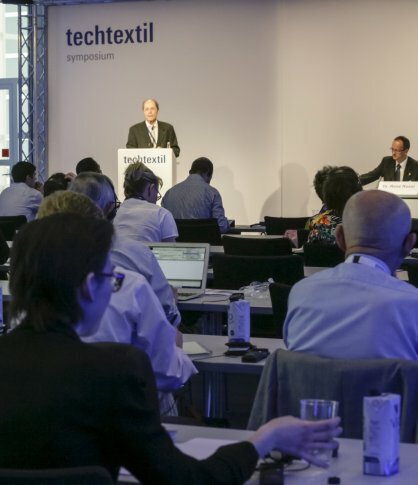 Tickets are now available for the Techtextil Symposium, the international expert forum taking place in parallel with Techtextil, the leading international trade fair for technical textiles and nonwovens. The symposium is taking place from 9 to 12 May 2017 in Hall 4.0, Saal Europa, at Frankfurt Fair. At the 19th edition of the symposium, international experts will present the latest research results, products and technologies for technical textiles, nonwovens and functional garment fabrics, in a total of seven half-day lecture blocks: New Fibres & Textiles, Industry 4.0, Circular Economy & Sustainability, Health & Protection, Smart Textiles and Composites. The themed lecture blocks will be chaired by Dr. René Rossi (Swiss Federal Laboratories for Materials Testing and Research - EMPA, Switzerland), Prof. Meike Tilebein (German Institutes of Textile and Fiber Research Denkendorf, Germany), Braz Costa (Technology Center for the Textile and Clothing Industry of Portugal - CITEVE), Dr. Klaus Jansen (Forschungskuratorium Textil e.V., Germany), Dr. Hartmut Strese (VDI/VDE Innovation + Technik GmbH, Germany) and Dr. Thomas Stegmaier (Institute of Textile Technology and Process Engineering Denkendorf ITV, Germany). In addition, on the afternoon of 10 May, the Dornbirn Man-made Fibres Congress, Austria, will be organising for the first time a block on the theme of 'Fibre industry geared to sustainability & resource management', led by Friedrich Weninger. Visitors who register by 25 April will benefit from the early-booking discount. Similarly, there are price reductions for students, university staff, and exhibitors at Techtextil and Texprocess. Tickets bought in advance also allow visitors to enter Techtextil and Texprocess. The complete programme for the Techtextil Symposium as well as information on registration and ticket purchase are available on the events page of the Techtextil website at: www.techtextil.com.